Grandcolas, P. 1996. The phylogeny of cockroach families: A cladistic appraisal of morpho-anatomical data. Canadian Journal of Zoology 74(3):508-527. Grandcolas, P. 1997. Systematique phylogenetique de la sous-famille des Tryonicinae (Dictyoptera, Blattaria, Blattidae). Memoires du Museum National d'Histoire Naturelle 171:91-124. Princis, K. 1965. 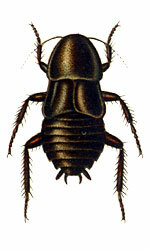 Blattariae: Subordo Blaberoidea. Fam. 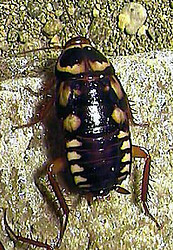 : Archiblattidae. Pages 386-389 in Orthopterorum Catalogus. Pars 7. M. Beier, ed. W. Junk, s'Gravenhage. Princis, K. 1966. Blattariae: Subordo Blattoidea. Fam. : Blattidae. Pages 401-602 in Orthopterorum Catalogus. Pars 8. M. Beier, ed. W. Junk, s'Gravenhage. Roth, L. M. 1993. The genus Macrocerca Hanitsch with descriptions of new species (Blattaria, Blattidae: Macrocercinae, subfam. n.) Entomologica Scandinavica 24(3):343-360. Roth, L. M. 1994. New Queensland cockroaches of Macrocerca Hanitsch and Periplaneta Burmeister (Blattidae). Memoirs of the Queensland Museum 35(1):225-233. Roth, L. M. 2003. Lamproglandifera flavoglandis, n. gen., n. 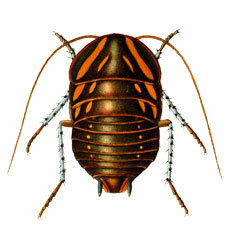 sp., from Brazil is described (Blattidae: Lamproblattinae). Transactions of the American Entomological Society 129(2): 285-293. Blattidae of Brisbane, Australia. Brisbane Spiders and Insects. 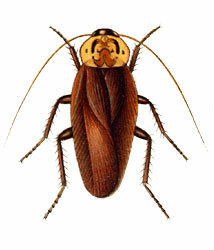 The American Cockroach, Periplaneta americana. University of Florida.